Summon: You may choose a card from your hand to swap with a or card in your Black Market. On the surface, this seems like the worst of the Smugglers, and indeed worse than any of the Merchants as well. While most of them have bodies worth at least 2 power, this one only manages a 1.5, as it can't quite muster the same health as Storm Lynx. However, the power of this card lies in the fact that it has Ambush. Being able to pull out Annihilate or Disjunction out of nowhere is pretty darn strong, and as such, I'd argue that this would be the best of its cycle... if only Time had better fast options. Regardless, it's still a much better card than it looks at first. 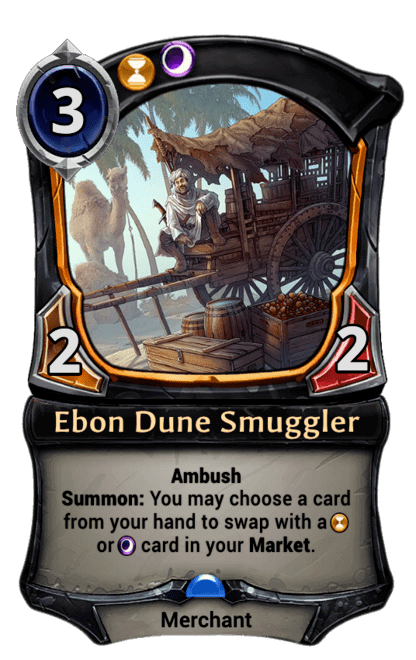 It's too bad the statline on this smuggler stinks; ambush on a merchant is super cool! Time + Shadow together lead to some nice flexibility as well - being able to pull out fast spells like Disjunction or Deathstrike after ambushing out the smuggler can lead to some real nasty surprises for your opponent.